Vianni offers exciting and stylish food warming equipment to hold and display food safely at the proper serving temperatures while preserving quality and taste. Sleek and durable, the Vianni Heated Shelf Food Warmers and Countertop Food Warmers are adaptable for front- of -the- house food warming and display requirements and back- of –the- house warming and holding demands. Vianni food warmers are ideal to fit commercial space and style requisites. Our Heated Black Glass Warming Shelves provide a sophisticated look to fit many settings. The Vianni food warming equipment is designed for built-in spaces, countertops and tables and fit handily into any foodservice locale. The Black Glass used for our Heated Warming Shelves, is designed and produced by SCHOTT, a 125 year old German company and global leader in glass technology and innovation. The Vianni Countertop Food Warmer is designed using a patented technology that SAVES up to 50% on energy consumption compared to conventional countertop food warmers. We carefully select top quality materials and the highest caliber components for maximum functionality. 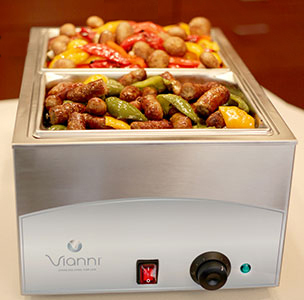 Durable stainless steel construction, reliable electronics such as German engineered EGO temperature controllers, Klixon Thermal protectors, Texas Instrument temperature cutoffs and Emerson adjustable thermostats are used in Vianni food warming equipment. We back our food warmers with a 2-year parts warranty against manufacturer workmanship or material defects. Vianni Food Warmers provide maximum performance using approved food safe materials, adjustable heat controls to keep foods safe at the proper serving temperature and thermal cutoff sensors to protect our food warmers against excessively high heat that can cause damage to the appliances. Our products are certified and listed by TÜV Rheinland, a leading independent and worldwide organization that tests, audits and certifies products and systems for performance. It is accredited by OSHA and the Standard Council of Canada to test products to American UL and Canada CSA electrical safety standards and uses FDA standards for food contact material testing. Available in a variety of sizes including built-in or portable models, Vianni food warmers provide the versatility to use in buffet lines, pass-through areas, serving stations, commercial kitchens and households.